Slam Ethics: Once Qualified, Should you Continue Competing? Last week (Thurs., Jan. 22) I was delighted to win the Edinburgh University Literature Society January Slam, thus qualifying for the Scottish National Slam (which will be held Feb. 26 in Edinburgh). However, I faced a bit of a dilemma because I was also slotted to compete in the National Library of Scotland Burns Night Slam … Continue reading Slam Ethics: Once Qualified, Should you Continue Competing? The Inky Fingers Open Mic is back for 2015! On the first Tuesday of the month between 8-11 pm, it’s free to come and free for anyone to perform, regardless of style, experience, or identity. 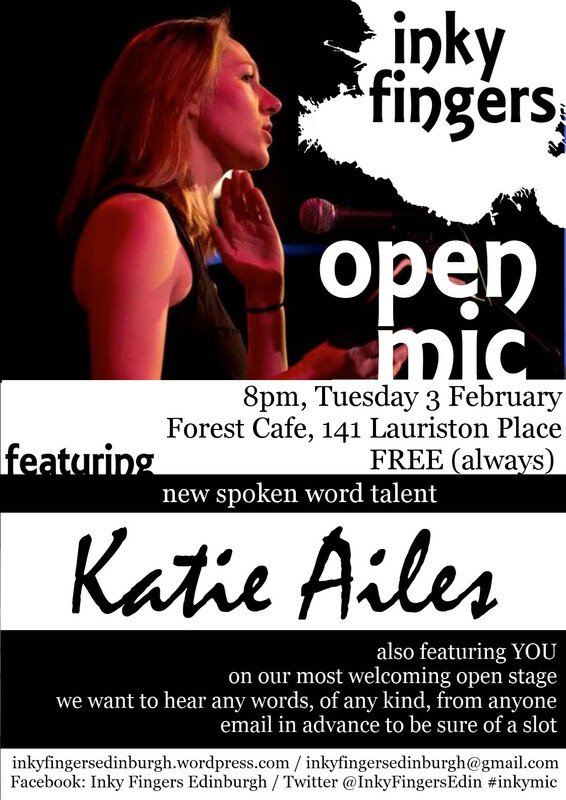 We are very excited to announce that this month’s feature is spoken word poet, Katie Ailes.